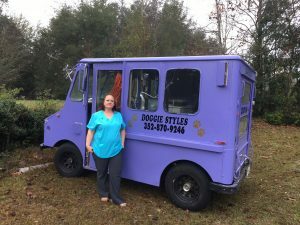 Doggie Styles is a unique company that offers mobile grooming and pet sitting. Our grooming provides baths, nails, ears, glands and hairstyles. You can pick and choose the pieces of the grooming process you would prefer for your pet. Our famous purple truck will travel up to 30 miles to drive to you. This unique company design gives our customers the convenience of staying at home while their pet gets pampered. It also provides a less stressful environment for your furry friend. What are the exact benefits? There are no crates necessary, car sickness or hassle. Your pet is the only animal in the purple truck, so it provides a clean area and a faster grooming time. This service is not just limited to dogs. Call us for your cat grooming needs as well. If you are looking for a pet sitter, look no further. Our staff has a strong background in the animal care industry and can easily meet the needs of you and your pet. Check out our purple truck services for your next appointment.